In some ways, racetracks are more obvious places to install AV than stadiums.When many people in the contracting industry think of "the sports market," their thoughts inevitably turn to stadiums-those vast, oval bowls for which many manufacturers of audio and video equipment make specially designed equipment. Whether we are being asked to specify weatherproof line-array loudspeakers or perimeter LED advertising boards, we know where we stand (as well as sit) in a stadium or arena. Yet many sports projects involve an entirely different kind of visitor experience-one where all the action is not visible, or indeed audible, to all of the crowd, all of the time. We're talking about the track, and whether it's the horses or high-powered NASCAR automobiles that are racing, the location requires a subtly different approach from those green, rectangular fields. In some ways, racetracks are more obvious places to install AV than stadiums. Customers may have paid hundreds of dollars to watch a Grand Prix from a spot right by the finish line, but when all those single-seater Ferraris, McLarens, Hondas, and so forth are over on the other side of the circuit, the racetrack commentator plays a vital role in keeping people informed, rather than merely entertained. It's not just a case of keeping the fans at trackside happy. VIP and media boxes are as important at the track as they are inside a stadium, and the more popular a sport becomes, the greater the need to keep press and broadcasters happy. Small wonder that NASCAR organizers recently took delivery of 150 custom-built Aviom mixers to improve the speed of communication between track and press box. The setup was used for the first time at the Las Vegas Motor Speedway and is expected to be adopted as a blueprint for future races. NASCAR's comprehensive press box features 150 custom-built Aviom mixers running between the track and press box at the Las Vegas Motor Speedway. It is the speed and immediacy of motor racing which gives the sport much of its appeal, and as broadcasters seek new ways of conveying this, so audio and AV engineers are required to stay, almost literally, one step ahead of the game. Hermann Gier, founder of Germany's Sound Performance Labs, now spends much of each year at Grand Prix circuits, setting up custom-made, surround-sound mic setups aimed at bringing a genuine racetrack atmosphere into people's homes. "In 2005 I met up with Hans Biermann, the head of audio at [German broadcaster] RTL," Gier recalled. "I'm an F1 fan and I asked him: 'When HDTV comes along and surround sound comes mandatory, what are you going to do about creating a 5.1 soundstage?' It turned out that RTL had experimented with dummy-head techniques and weren't happy." Hermann Gier, founder of Germany's Sound Performance Labs, now spends much of each year at Grand Prix circuits, setting up custom-made, surround-sound mic setups aimed at bringing a genuine racetrack atmosphere into people's homes. 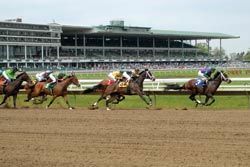 Race horses can't match manmade horsepower for speed or sound level, but that doesn't mean racegoers in this historically more conservative field are immune to the benefits of AV. Kempton Park racetrack, just outside London, recently took delivery of two LED videowalls from Lighthouse Technologies in order to enrich its visitor experience. One, believed to be the largest widescreen LED structure in Europe, has been installed at trackside and allows racegoers to follow their horse from the start to the finish line, as well as to watch replays and races from concurrent race meetings taking place elsewhere. The other has been installed in the parade ring, giving visitors a chance to see close-ups of horses without venturing from the comfort of their grandstand seat.Content to the screens is delivered via Lighthouse X-Drive Pro units, with an Extron ISS-408 switcher enabling a range of different input sources (from in-house cameras to network and cable TV) to be connected to the system. An Extron RCP-2000 control desk gives Kempton's AV operators real-time control. According to systems integrator Steve Prior, the LED screens are the first stage in an ongoing process for Kempton Park. "The track had its priorities," Prior said, "and the big screens were one of them because, logically enough, if you're at the races then the most important thing is that you see the race." Interestingly, though, Prior expressed concern that some racetracks can have more AV than is good for them-and, ultimately, more than is good for the contractors supplying them. "At a lot of racetracks, if you walk around the public areas there's a lot of AV content coming at you from everywhere-in the bars and the restaurants and the VIP boxes, on plasma screens and LCDs and through loudspeakers. It's there because people expect it to be there, but it's completely unstructured," Prior said. "Typically, what happens is that people are having so much fun eating, drinking, and watching the TV that they forget to actually have a bet. So the course is missing out on income, and we need to structure the AV content so that revenue opportunities aren't missed."